This name uses Spanish naming customs: the first or paternal family name is Túñez and the second or maternal family name is Arceo. Andrés José Túñez Arceo (American Spanish: [anˈdɾes ˈtuɲes]; born 15 March 1987) is a Venezuelan professional footballer who plays for Thai club Buriram United F.C. as a central defender. Túñez was born in Caracas, Venezuela to José "Pepe" Túñez and Margarita Arceo, a family of Spanish immigrants from Galicia. Aged 7, his family would return to their hometown of Bertamirans, Ames. Túñez began playing football at Colegio La Salle primary school, in the nearby city of Santiago de Compostela. Three years later, he continued his development by joining a football school – Escuela de Fútbol de Rosalia de Castro – where he would play in their youth teams for the following five years. After another youth spell at SD Compostela, he joined neighbours RC Celta de Vigo's Juvenil side. 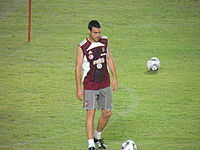 In February 2010, following Jordi's transfer to FC Rubin Kazan, Túñez was promoted to the first team. He had spent nearly four seasons with the reserves in Segunda División B, and finished that campaign with 16 league appearances with the main squad, which competed in Segunda División. Túñez contributed with 29 games (all starts) in 2011–12, as Celta returned to La Liga after an absence of five years. He scored his only goal of the season on 28 January 2012, in a 1–0 away win against Girona FC. Túñez played his first match in the Spanish top flight on 18 August 2012, starting in a 0–1 home loss to Málaga CF. Tuñez training with Venezuela in 2011. 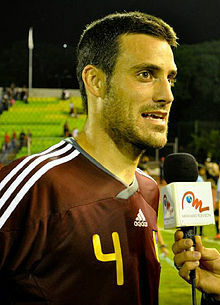 On 24 February 2010, it was reported in the local papers that the Venezuela national team had approached Túñez's agent with an offer for the player to represent the nation. He made his international debut in September of the following year, playing injury time in a 0–1 friendly defeat with Argentina. ^ Pais, Antonio (11 December 2009). "Túñez, una zurda de oro para un Celta de ¿Primera?" [Túñez, a golden left foot for a topflight Celta?]. El Correo Gallego (in Spanish). Retrieved 27 February 2010. ^ Piñeiro, M. (28 January 2012). "Túñez, tres puntos de cabeza para el Celta en Girona" [Túñez, three points with a header to Celta in Girona]. La Voz de Galicia (in Spanish). Retrieved 22 September 2013. ^ "Olinga makes history". ESPN FC. 18 August 2012. Retrieved 22 September 2013. ^ Conde, J. (24 February 2010). "Venezuela quiere convocar Túñez" [Venezuela want to call up Túñez]. Faro de Vigo (in Spanish). Retrieved 28 January 2010. ^ "Túñez debutó con Venezuela en el tiempo de descuento" [Túñez made Venezuela debut in injury time]. La Voz de Galicia (in Spanish). 3 September 2011. Retrieved 22 September 2013. ^ "A. Túñez". Soccerway. Retrieved 21 May 2014. This page was last edited on 17 April 2019, at 00:58 (UTC).